It’s a cheerful wintertime scene that could have been drawn by any happy young child. 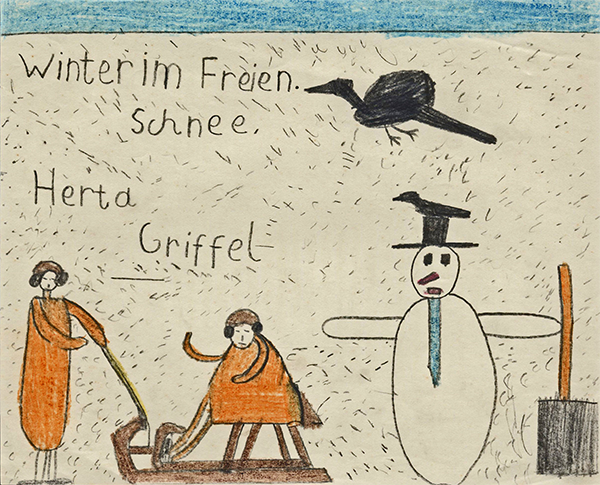 But this picture was created by seven-year-old Herta Griffel, just before her life took a sharp turn. View more of Herta’s artwork and artifacts that are part of the Museum’s collection. Shortly after this drawing was created, Herta and the other Jews in Vienna were in grave danger of being deported to their death. An American-Jewish organization rescued Herta by sending her to safety in Baltimore. However, she was the only girl in her class to survive the Holocaust. Herta’s mother and her teacher, Gertrude Winter, met the same cruel fate as the students. Before she was deported, Gertrude gave hundreds of pieces of their school work to her neighbor for safekeeping. The Museum recently acquired this collection, which gives voice to these innocent young children through their artwork, photographs, and writings. As a curator, I know how important it is to preserve and make public artifacts like these drawings. They help us recognize that the victims of the Holocaust were ordinary people just like us before their lives were destroyed by hate. Discover more about Herta and honor the memory of the Holocaust’s youngest victims by learning more about their experiences.